1952. When a nun in a remote Romanian abbey commits suicide, the Vatican dispatches Father Burke (Demian Bichir) and the novice Sister Irene (Taissa Farmiga) to investigate. Irene believes it is a run-of-the-mill, albeit unusual, assignment. Father Burke already knows that their mission is of a more supernatural nature. While every studio in Hollywood fights to establish their own shared universe of populist blockbusters – Disney has the Marvel Cinematic Universe and Star Wars, Universal tried with Dark Universe, and Warner Bros stumbles along with their DC Extended Universe – Warner Bros subsidiary New Line Pictures has quietly established its own hugely successful interconnected franchise of horror movies. It began with The Conjuring (2013) and expanded to include a sequel and two spin-offs focused on the doll Annabelle, which has been possessed by a demon. 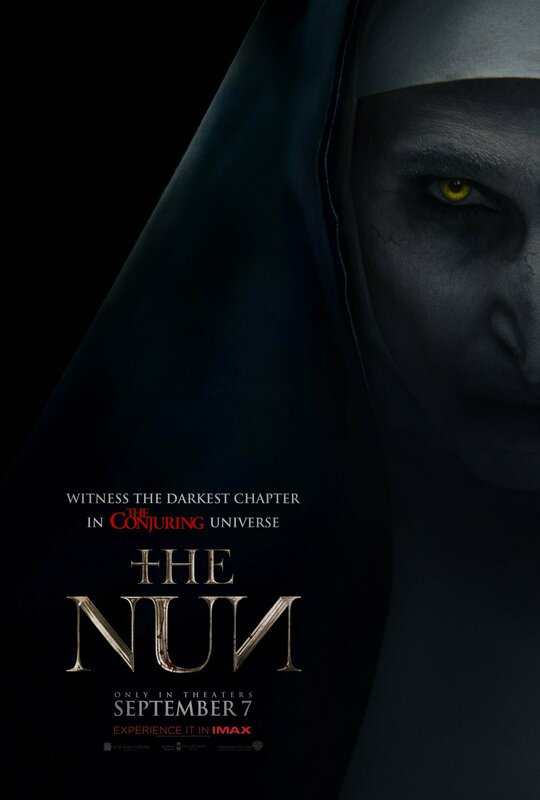 Now the franchise expands to a fifth installment: The Nun, based around the demon Valak who was introduced in 2016’s The Conjuring 2. Valak, who takes on the appearance of a gaunt, near-skeletal nun, made a tremendous visual impact in her first appearance. The use of shadow and manipulation of depth of field developed her into the franchise’s creepiest villain so far. Script-wise there wasn’t much depth, but the visceral impact of her on-screen made for a tremendously horror icon. It is that disturbing aesthetic and nightmarish imagery that has made her such a ripe character to bring back and expand. I’m straining to recall, and am happy to be corrected, but I think The Nun may be the first-ever sequel based in essence on a visual effect. Mind you, that allows this new film to chart its own course. Aside from a brief prologue and epilogue, there is not that strong a connection to The Conjuring films. It is a great balance: independent enough to be an entertaining horror flick on its own merits, but packed with enough references to give it an extra layer of fun for viewers of the previous movies. It takes a different direction to its predecessors: chronologically it is the earliest story, set as it is in the early 1950s. It also has a wonderfully old-fashioned Eastern European setting and an appropriately gloomy, gothic tone. It may be mostly pastiche, but it is effective pastiche. It is a solid horror film. There are plenty of jumps and scares, and creepy sequences in dimly-lit corridors, crypts, and graveyards. It also tosses in just enough original moments to have a vital spark; this isn’t by any stretch the best horror film of the year, but it knows what it’s doing and it does it very well. The surprises, when they come, are well-earned. Director Corin Hardy could have easily embraced the grand, gothic style that the story and setting suggest; instead he mixes the direction up with a combination of traditional and more up-close, hand-held photography. (This solid cinematography comes from Maxime Alexandre (The End, Annabelle: Creation).) Valak continues to look great, of course, and re-uses a lot of the techniques – both overt and subtle – that worked so well in her first appearance. The characters work well. Taissa Farmiga brings a nice balance of naive optimism and dogged determination as Sister Irene, although it is odd that Farmiga was cast given that her older sister Vera is the lead actor in The Conjuring and its sequel. One spends the film waiting for a familial relationship to be revealed between Irene and The Conjuring‘s Elizabeth Warren; it never is. As Father Burke, Demian Bechir presents a lot of gravitas and authority. It is a thinly drawn role, but Bechir makes it work. Importantly, both actors buy into the style of film and perform their roles accordingly. With a steady eye on further franchise potential, the film certainly keeps its options open for a follow-up or two in future years. I would be quite happy to see them. The Conjuring films (potentially the first Annabelle aside) are slickly developed pulp entertainment, constructed by filmmakers that know their audience and subject matter, and whose top priority is simply to entertain. The Nun is exactly that: a scary, thrilling entertainment that doesn’t disappoint.